↑ Entekhab.ir, پایگاه خبری تحلیلی انتخاب. "توضیحات مجلس خبرگان درباره جلسه انتخاب آیت‌الله خامنه‌ای به عنوان رهبر در سال 68/ آیت‌الله گلپایگانی فقط 14 رای داشت". http://www.entekhab.ir/fa/news/387806. ↑ "letter to Hashemi Rafsanjani and resignation from presidency" (in Persian). Khamenei.ir. 16 August 1989. http://farsi.khamenei.ir/message-content?id=2165. Retrieved on 17 July 2018. ↑ "چه کسی در نخستین انتخابات خبرگان اول شد؟ +جدول". 7 January 2014. https://web.archive.org/web/20171010024415/https://www.mashreghnews.ir/news/520344/%da%86%d9%87-%da%a9%d8%b3%db%8c-%d8%af%d8%b1-%d9%86%d8%ae%d8%b3%d8%aa%db%8c%d9%86-%d8%a7%d9%86%d8%aa%d8%ae%d8%a7%d8%a8%d8%a7%d8%aa-%d8%ae%d8%a8%d8%b1%da%af%d8%a7%d9%86-%d8%a7%d9%88%d9%84-%d8%b4%d8%af-%d8%ac%d8%af%d9%88%d9%84. ↑ "Parliament members" (in Persian). Iranian Majlis. https://web.archive.org/web/20140707095033/http://rc.majlis.ir/fa/parliament_member/show/762450. Retrieved on 28 October 2014. ↑ "جامعه روحانيت مبارز جوان مي‌شود" (in Persian). Fararu. 8 July 2012. https://web.archive.org/web/20160902124141/http://fararu.com/fa/news/118101/%D8%AC%D8%A7%D9%85%D8%B9%D9%87-%D8%B1%D9%88%D8%AD%D8%A7%D9%86%D9%8A%D8%AA-%D9%85%D8%A8%D8%A7%D8%B1%D8%B2-%D8%AC%D9%88%D8%A7%D9%86-%D9%85%D9%8A%E2%80%8C%D8%B4%D9%88%D8%AF. ↑ Kazemzadeh, Masoud (n.d.). "Ayatollah Khamenei's Foreign Policy Orientation". Comparative Strategy 32 (5): 443–458. doi:10.1080/01495933.2013.840208. ISSN 0149-5933. http://www.tandfonline.com/doi/abs/10.1080/01495933.2013.840208. 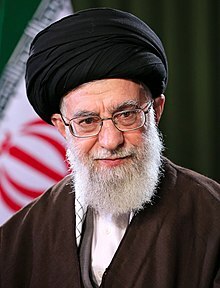 "Profile: Ayatollah Ali Khamenei". BBC News. 17 June 2009. http://news.bbc.co.uk/1/hi/world/middle_east/3018932.stm. Retrieved on 1 جنوری 2010.